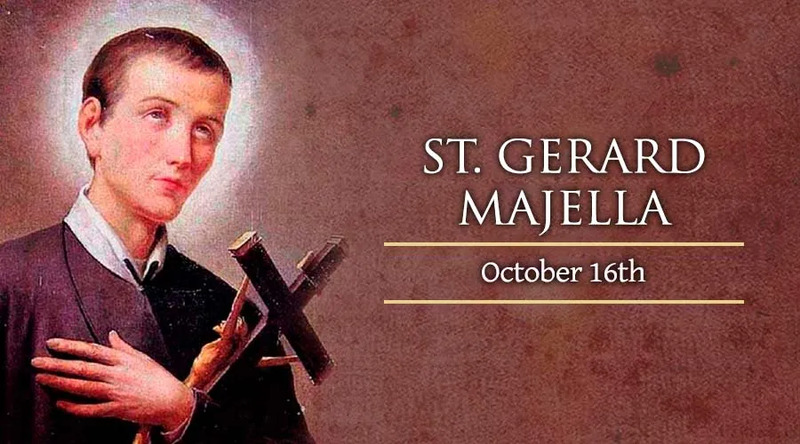 On October 16, we celebrate the feast of St. Gereard Majella. Born the son of a tailor on April 23, 1726 in Mro Lucano, Italy, he became a tailor's apprentice upon the death of his father. At a young age, Gerard tried to join the local Capuchins, and was turned down because of his youth, so he instead became a servant in the household of the bishop of Lacedonia, a cantankerous master who treated him badly. Upon the death of the bishop in 1745, he returned home and opened a tailor shop. He joined the Redemptorists as a lay-brother in 1748 and was professed by its founder, Saint Alphonsus Ligori, in 1752. He served as tailor and infirmarian and became known for his extraordinary supernatural gifts of bilocation, prophecy, ecstasies, visions, and infused knowledge. Though not a priest, his spiritual direction and advise were sought by many onomg the clergy and communities of nuns, to which he also gave conferences. He was most successful in converting sinners, and was widely known for his holiness and charity. When, in 1754, he was accused of lechery by a woman named Neria Caggiano -- a charge she later admitted was a lie -- he did not deny her charges, and his puzzled superiors put him under surveillance and excluded him from communion for months, until the girl admitted that she had lied. When asked by Saint Alphonsus why he had kept silence in such circumstances, Gerard replied that he thought that was what was required in the face of unjust accusations. He was sent to Naples soon after, but when the house there was inundated by visitors wanting to see him, he was sent to Caposele a few months later, and served as the porter there, and ministered to the poor of the town. He spent the last few months of his life raising funds for new buildings at Caposele, where he died of teburculosis on October 15, 1755 at the age of 29. He was canonized December 11, 1904 by Pope Saint Pius X, and is the patron of childbirth, children, expectant mothers, falsely accused people, good confessions, lay brothers, motherhood, mothers, pregnant women, pro-life movement, and unborn children.